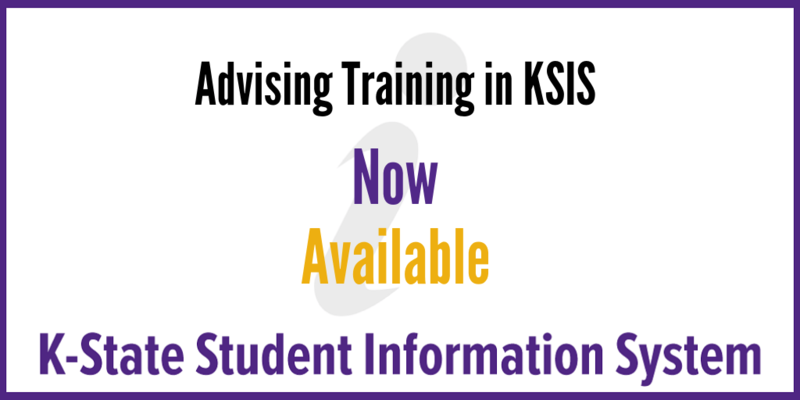 Training dates for Advising in KSIS are now available for spring 2019 sessions. Sessions focus on the KSU Advisor Center functions. Full-time advisors and faculty advisors are encouraged to attend. Registration through HRIS is required. See Using HRIS to register for classes. Tues., Feb. 12, 9 a.m. – 10:30 a.m.
Wed., Feb. 13, 3 – 4:30 p.m. Thur., Feb. 21, 1:30 – 3 p.m.
For more information on current advising processes, visit the KSIS for advisors web page. See the KSIS training web page for additional classes. If the available training sessions do not meet your schedule, please contact Fred Darkow at fdarkow@ksu.edu for further training options.